Keeping kids physically active and healthy is one of Coach Rachel's passions. She is a fully credentialed physical education teacher that fosters student learning in an enjoyable yet structured environment. The Physical Education lessons are aligned with California state standards for each specific grade level and activities and games are developmentally appropriate. Safety and teamwork are two important concepts that are incorporated into the learning structure. The activities help to develop students' physical skills and fitness level while teaching sportsmanship, cooperation, and healthy competition. 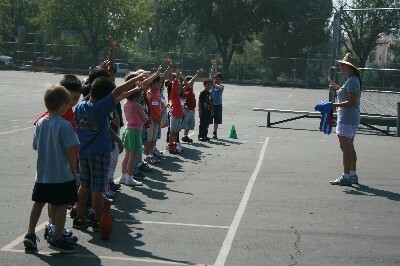 Character counts in P.E. so the importance of "the golden rule", honesty, and kindness are emphasized. All students should reach their full potential!